Anyone know hwre i can get my hands on a hex mat here in Oz? Im after about 4cm wide and porobably sky blue. I had no luck at all in my own search. In the end I had to order mine from overseas. I wonder if there is a market in Oz for someone to make them? Where did you order it from Dropbear? had to get mine from OS a few years back as well. I went with them after hearing bad things about Holtz Mats in regards to taking forever and a day to send you what you had ordered. can't help but ask, old habits and all, is this thread in the right room? This room is about aerial gaming is it not? Thats what I want to use it for. ah,,wasn't exactly clear..clarity is useful at times like this..
mate go to a carpet shop and have a look at the lino patterns, I picked up a hex mat for canvas eagles 1/72 scale, in a brown colour, I then painted on the buildings rivers and woods. 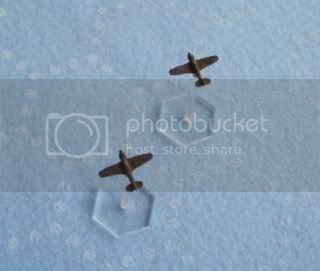 Here is a close up of my hex mat with some 1/600 scale planes taken during a CY6! game. I have a Hotz mat and am very happy with it, Eric does them in batches so if he is about to do what you want you get it right away if not you may need to wait a few weeks till he gets enough orders to do a run, I got mine in 2 weeks from Canada which I think is OK. I got European fields as seen from above with 5 inch hexes which are just right to fit the wings of war bases. The 1 inch hex mat I got for 1/300th I got from Monday Knight I was not happy with and have donated it to the club.